The problem with SEO (search engine optimization), is that search engines are constantly changing how they find websites. It's impossible to stay up-to-date on all the changes and still focus on your content. That's why I love Yoast SEO. Yoast is a plugin for WordPress, it's also known as the best tool ever. Okay I made that up, but it is a fantastic resource and a quick way to help those search engines find you, without wasting time. You can get the plugin here. Yoast does a TON of stuff, but for now I want to focus on the SEO for your individual blog posts or pages. If you want to dive further into the plugin you can check out their site here. It will be blank when you start, but I have mine filled in for this particular post to show you some examples. 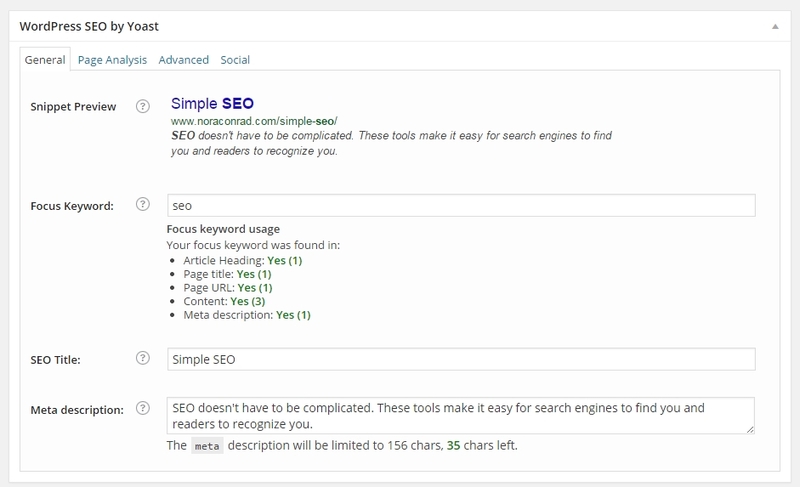 The snippet preview is how your post or page will look on the google search pages. Focus keyword should be the one word that best describes your post, for this one I chose SEO. Under this, you can see how many times your chosen key word is used, aim for at least one in each section, and more in the content section. This will help your post/page be optimized. The SEO title is what search engines will make your title, I usually use the same title as the post, or a shorter version if it's too long. Under meta description you want to advertise your post/page. Tell readers what they can expect. I also use this for my header image description, but more on that later. Once you save your post/page - there will be a colored dot under your publish tab. The color will indicate how optimized your post/page is for the search engines. You want to aim for green, yellow is OK and red is POOR. If you aren't sure how to optimize further, that's what the next tab is for! This tab shows you exactly what you should improve on to optimize the post! You want all the dots to be green, or at least yellow. The more green, the better your post is optimized for the web. Under the advanced tab is more options for you to configure the SEO settings, however unless you're familiar with SEO, you should probably leave that tab alone. Under the social tab, you can add different descriptions and images for Facebook, which comes in handy if you share your work on multiple platforms. It's tedious, but you should go through all your old posts and pages and fill out the Yoast form for every one. Not only will this help you get more familiar with the process, but your SEO score will sky rocket. Just by adding a keyword to each page, you can more than double your traffic. Search engines are looking for information when they share your site, and unless you provide them with that info, they won't be able to share it. Adding SEO to your pages and posts will help new readers and clients find you faster and easier. On top of being a quick way to optimize your posts, Yoast also makes other things much simpler. You know those fancy Pins you see on Pinterest with the recipes under the image, or the price and shop info under the product? Those are called rich pins - and if you have Yoast, signing up for Rich Pins is 100 times easier. Is your site mobile-friendly? Google will push your site further down in the search results if you don't have a mobile friendly website. You can check if your site is good to go right here. My friend Brittany over at the Kardia has a post all about Keywords, check it out. Remember how you wrote a description under meta description? I make images for each of my posts, so they can be pinned. When someone pins your image, you want their followers to know what that pin is all about. If you fill in the "alternative text" area on an image, the pin description will auto-fill with that text. How do you improve your search engine results? Let us know in the comments! So You Want to Start a Blog? A guide to getting started.